ClearEdge is publishing ads (via adsense) suggesting that before you consider solar or wind power systems, that one considers fuel cells. That piqued my curiosity and I'm taking a look. The thing about fuel cells is they, well, require a fuel. Solar or wind power systems do not require fuel, and derive power from innate characteristics of the universe like sunlight or wind. That means a user of a fuel cell has to pay money to someone who provides the fuel. On the other hand a user of a solar panel or wind turbine has to pay for that equipment, just proving that there ain't no such thing as a free lunch. Their claim is that the fuel cell system is more efficient than competing solar or wind power systems. I do believe that fuel cells make more sense in fixed installations rather than in vehicles. ClearEdge5 is a combined heat and power (CHP) energy system based on fuel cell technology. It consists of three core components modularly designed for ease of installation and maintenance. The Fuel Processor converts natural gas into ultra-clean hydrogen through a catalytic process, as opposed to burning the natural gas, which dramatically reduces pollutants. Hence it would require natural gas service at ones house. The thing is designed to interconnect with existing building electrical systems. Its designed so that if the grid goes down, it switches to a "grid sustaining" mode and to provide backup power keeping your lights on even if the neighbors lights are off. They say the list price is less expensive than equivalent photovoltaic systems. For the same capital investment, the ClearEdge5 gives you 90 MWh of annual combined electricity and heat, compared to approximately 8MWh generated by a 5kW solar system. Nowhere on the site do they discuss what happens to the parts of natural gas other than the hydrogen. That is the unit contains a reformer unit to strip hydrogen out of natural gas. The DoE page on natural gas reforming shows several methods. The chemical notation for natural gas, CH4, indicates it has one carbon atom and four hydrogen atoms per molecule, and that all the separation methods causes creation of carbon monoxide (CO). Hence this sort of unit is "clean" only by some curious definition of "clean". Solar power at the cost of coal? Among the recent awardees of DoE funding for transformational energy projects is a small company, 1366 Technologies, who is making a mighty big claim. That photovoltaic panels will soon become the largest manufacturing industry in the history of mankind. This is due to development of photovoltaic panels costing the same as coal fired power plants. What's held the solar electricity industry from broad acceptance is cost competitiveness against dirty old coal. Coal has a zillion problems with it that harm our health and the environment around us, any sane society would have banned coal use long ago, but it's just as insane to ban a critical technology for which there's no replacement no matter how bad is the technology. Renewable energy like wind and solar have held a lot of interest but the cost has kept them from being widely adopted. Fortunately the cost of both is dropping, and 1366 Technologies points to a cost reduction curve which predicts that by 2020 photovoltaics will have a price equal to the price of coal fired power plants. 1366 Technologies has developed technology to decrease cost of production while increasing solar panel efficiency. Over time decreasing the cost while increasing efficiency will improve the cost per kilowatt figures to enable greater adoption. Their website describes two technologies. The "Self Aligned Cell" textures the surface of a photovoltaic cell to improve efficiency. The texturing process creates a geometrically optimized cell surface for better light capture and trapping. The "Light Capturing Busbar" is an improvement on the wires embedded in photovoltaic cells that allows energy capture from the cell area behind the wires. The grooved surface of the busbar reflects light in a way that it bounces around inside and is absorbed by the photovoltaic cell, unlike conventional busbars that simply block light. Together these allow multi-crystalline cells that typically have lower cost but also lower efficiency to have efficiency equal to monocrystaline cells. A third technology, Direct Wafer, is mentioned in some press releases without being described on the website. The honeycomb texturing technique by itself, increases overall solar cell efficiency by 1 percent, while making the metallization lines thinner boosts efficiency by another 1 percent or more, according to announcements released by 1366. In Feb 2009 they were awarded an 18-month $3 million subcontract with the National Renewable Energy Laboratory (NREL) and the U.S. Department of Energy (DOE) for the “Self-Aligned Cell: Scaling up manufacture of a cost effective cell architecture for multi-crystalline silicon photovoltaics” Project. 1366 Technologies will use the Solar America Initiative Agreement funds to further develop its Self-Aligned Cell technology which allows cost-effective, scalable manufacturing of multi-crystalline solar cells. In October 2009 they were awarded four million dollars in federal funding from the Advanced Research Projects Agency -- Energy (ARPA-E) of the U.S. Department of Energy (DOE). This funding is to go towards development of their Direct Wafer technology which promises to solve the wafering problem with a breakthrough manufacturing solution that is compatible with today's supply chain. "This funding will allow us to accelerate the development and scaling of Direct Wafer, which will have strong implications for the competitiveness of the U.S. PV industry and provide a basis for future economic growth and jobs" said Frank van Mierlo, co-founder and president of 1366 Technologies. The company's goal is to make and sell texturing and metallization machines that solar cell manufacturers can incorporate into their existing assembly lines. Indeed in July 2009 they received their first order to build a prototype machine. Machine construction is expected to require 10 months. If all goes well this will open the doors to further machine sales. More-Powerful Solar Cells: A new solar cell is 27 percent more efficient without being more expensive to make. A look at current practice and potential related to biomass use for powerplants, and the evolving effort to develop viable biofuels for transportation. Addressing the energy payback and carbon neutrality of biomass and biofuels; Indirect effect of water pollution and waste management laws on the development of renewable energy. The other day talking with a friend I noticed a Waste Management trash truck roll by and had this sudden reflection "I own a piece of that truck". I own a few shares of WM's stock, hence I "own" a tiny fraction of the truck that rolled by. She was surprised and asked "you don't do socially responsible investing, then?" While I try to select companies with socially responsible thinking my investments are not SRI pure. Take that for whatever it is worth, the stereotype attached to Waste Management is they're an evil corporation just doing the worst thing possible with the trash we throw away while painting their trucks green to pretend they are environmental stewards. Greenwashing, in other words. Turns out that stereotype isn't entirely accurate. Turns out that Waste Management has a bunch of environmental information on their web site. While putting brochures on a web site doesn't fix the environment it shows they are at least thinking about it and recognizant of their role in environmental stewardship. I don't know how well they do as environmental stewards. However it's clear they have the potential to play a large role due to their position of receiving all the trash people throw out. That trash is potentially a resource stream which can be turned into products. It's not just Waste Management but every "trash" company in the world, if there were technology whereby they could perform recycling on a huge scale of every item that comes into their hands it would perhaps erase the word "landfill" from our vocabulary. Unfortunately that potential isn't anywhere near being implementable. One small piece to the puzzle is the "landfill gas" that lots of waste companies, Waste Management included, is looking at tapping. This gas is a form of natural gas and can be burned just as natural gas, and being a biogas has some positive environmental benefit over fossil natural gas. It can also be liquified into a fuel to use in trucks. On November 2, 2009, Waste Management and the Linde Group announced a project at the Altamont Landfill (near Livermore CA) which makes liquified natural gas from landfill gas, the LNG will be used to power Waste Management's trucks. They believe the plant has the capacity to produce 13,000 gallons of fuel per day, from that one plant. Given that it's from just one of Waste Management's landfills, it's mind boggling to think of the quantity of landfill gas emitted from all landfills around the country (or around the world), and how much fuel that represents. Energy production from landfill gas turns out to be a big deal. Yahoogling for "landfill gas renewable energy" turns up lots of interesting articles and resources. The following is just a smattering of what I found. 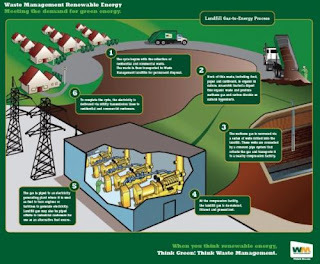 The landfill-to-energy process begins with garbage collected and brought to landfill operations. Much of it is organic and is broken down by bacteria in a natural process. 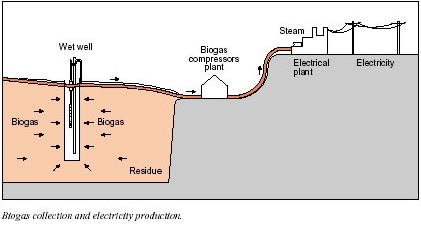 Methane and other gasses known as landfill gas is produced. With special wells the gas is captured and piped to a processing facility. After processing it is the same as natural gas and can be used the same way. Each landfill gas "well" is just a couple pipes drilled into the ground. 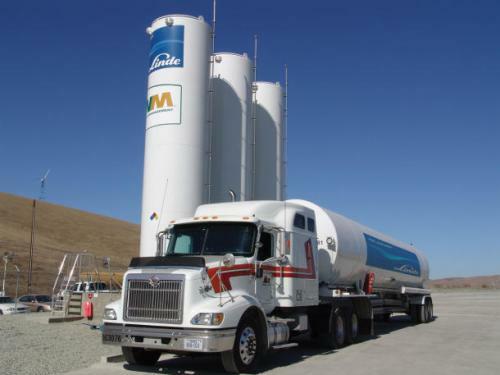 Waste Management Partnering to Find Gas in the Trash: This project at the Altamont Landfill is only one of many which Waste Management plans to launch. 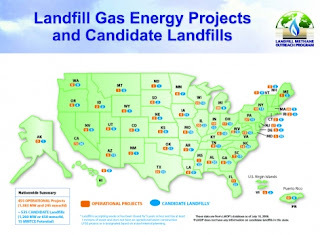 They own 477 landfills and have announced intent to open 60 landfill gas projects by the end of 2012. Further there are 1,700 operating landfills in the U.S., and according to the the EPA’s Landfill Methane Outreach Program, they contain enough natural gas to produce 2,643 megawatts of electricity. CARB tables of landfill gas composition shows the percentages of different constituents to landfill gas. On average it's 44% methane and 35% CO2, both are recognized as the leading components to greenhouse gas. Clearly averting the emission of those gasses into the atmosphere would abate some greenhouse gas issues. However burning the landfill gas doesn't destroy the carbon. Therefore burning landfill gas cannot avert emission of the landfill gas. What it can do is replace the use of some fossil natural gas or fossil liquid fuels. 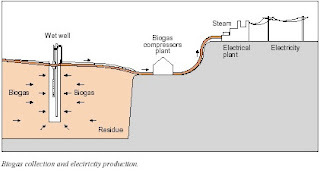 Production of 25 MW of Electricity Using Landfill Gas: Describes a project in Montreal (Canada) to build an electricity plant that uses landfill gas as its fuel. The plant cost CAD $37 million to build and produces 25 megawatts of power. Video: Powering Up with Landfill Gas: Discusses a similar project at the University of New Hampshire. In the video it's mentioned they've been "flaring" their landfill gas, and are now instead using it to generate power. Flaring gas just means they're burning it with no attempt to capture any energy. Turning it from a flaring to power production situation is an improvement by any measure. Waste-based Renewable Energy: Landfill operators place collection wells that act like straws throughout a landfill to draw out the methane gas. The gas is then piped to a compression and filtering unit beside the landfill. Technicians make sure that the gas is filtered properly before it is piped to its end user. The entire process is carefully managed to prevent odors and leakage of waste material. California Energy Commission, Renewable Energy Research, Biomass and Landfill is a resource center about landfill gas research in California. When a landfill is capped, landfill gas (LFG) is generated as organic portions of the municipal solid wastes (MSW) are decomposed. Traditionally, landfill is not controlled and the expected period over which landfill gas will be produced may range from 50 to 100 years. But a usable landfill gas production rate that can be utilized lasts for only 10 to 15 years. A bioreactor is a controlled landfill in which water and other nutrient sources are added into the MSW to increase the landfill gas production rate. conversion to other chemical forms. California leads the nation in both the solid waste generation and number of landfill gas to electricity (LFGTE) facilities. The Puente Hills landfill, operated by the Los Angeles County Sanitation District, produces approximately 46.5 MW of power and is the largest LFGTE facility in the U.S. US EPA Landfill Methane Outreach Program (LMOP): is a voluntary assistance and partnership program that promotes the use of landfill gas as a renewable, green energy source. 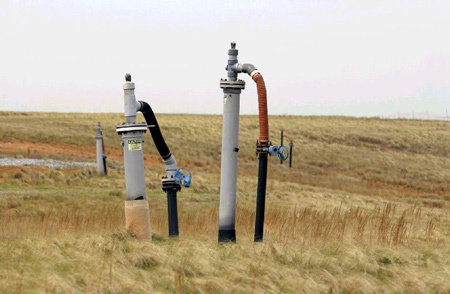 Landfill gas is the natural by-product of the decomposition of solid waste in landfills and is comprised primarily of carbon dioxide and methane. By preventing emissions of methane (a powerful greenhouse gas) through the development of landfill gas energy projects, LMOP helps businesses, states, energy providers, and communities protect the environment and build a sustainable future. Instead of allowing LFG to escape into the air, it can be captured, converted, and used as an energy source. Using LFG helps to reduce odors and other hazards associated with LFG emissions, and it helps prevent methane from migrating into the atmosphere and contributing to local smog and global climate change. Is Landfill Gas Green Energy? Is a study by the Natural Resources Defense Council looking at just how "green" an energy can one get from landfill gas. Combustion of raw LFG in a flare, an engine, or a turbine dramatically reduces the overall toxicity. Collection and combustion dramatically reduces global warming impacts and toxicity. Using LFG to generate electricity further reduces the greenhouse gas impacts and also reduces emissions of nitrogen oxides, sulfur dioxide and mercury. Burying garbage in landfills results in the release of more heat-trapping gases than any other waste-management option. Because LFG is a by-product of landfills, and landfills are such a poor way to manage our waste, LFG can not be considered renewable. An Overview of Landfill Gas Energy in the United States: Methane as GHG is over 20x more potent by weight than CO2. In October 2009 the UK Energy Research Centre released an indepth report on Peak Oil. In this episode of the Technosanity Podcast we go over several articles discussing the report. "Global Oil Depletion" a report on Peak Oil by the UK Energy Research Centre is my summary of the report. Of especial interest is the following two charts. This shows the rate of oil discovery over the years, and shows that the peak of oil discovery occurred in the early 1960's. The lack of discovering oil is not due to a lack of searching, it is due to a lack of finding. The lack of finding new significant oil discoveries implies strongly that the fossil oil resources on this planet have all been tapped out. The important wedges in this chart are "Crude oil - fields yet to be developed" and "Crude oil - fields yet to be found". Looking at the chart it appears the IEA expects on the order of 40 million barrels/day will come from those two sources. The first, fields yet to be developed, is oil that's known to exist but hasn't had infrastructure installed to extract the oil. The fields yet to be developed require extensive investment to install that infrastructure. The fields yet to be found simply aren't known yet. Where are they? We don't know. The IEA is putting a lot of credence in the wish or hope or expectation that those fields will be found. Maybe they'll be found, maybe not. There needs to be a long lead time to install the infrastructure - something like 10 years to build out an oil field full of oil derricks etc. Peak Oil - It's Still Coming, It May Be Delayed Though, Whither Resilience and Transition? Why ‘Peak Oil’ Has Yet to Outlive its Usefulness, Oil production could peak in 10 years' time, Have We Reached Peak Oil? and A post-oil world gets less sci-fi by the day all go over the same UKERC study. The UKERC study warns that the world society will have to find 64 million barrels/day in production by 2030 to replace the decrease in production they expect by then. This is shown on the above chart. But it's not clear where that oil will come from. Canadian tar sands? The Canadians doubt they'll ever get more than 3 million barrels/day in production. There are four key issues about oil production and which together point to a supply crunch sooner rather than later. Reflections from ASPO: Contradiction, EROI, and Future Energy Supplies is a look back at the recent conference of the Association for the Study of Peak Oil. He talks at length about Energy Return on Investment (EROI) in regard to some claims about "Shale Gas" resources. Someone claims there's 200+ years of natural gas available from Shale Gas. However what's missing from that claim is the EROI of extracting that gas, and if it requires a lot of energy to extract natural gas from shale then is it worthwhile to do so?